On a cold night at the University I, along with fellow students Amanda Jesser and Julianne Ersfeld, were caught practicing a heinous crime: drawing on the floor with chalk! Now as trivial as it seems, in the midst of our frigid mid-night efforts, University Security claiming there had been an abundance of vandalism on campus lately stopped us. Although we assured him we were not responsible for any vandalism or any prior chalking, he still found it necessary to hold us in our outdoor location while we wait for University Police to arrive and question our intentions and us. When UPD arrived after about 15 minutes of awkward conversation, they took our information down and it was an overall uncomfortable experience for us all. I know what you may be thinking how can someone get arrested for playing with chalk. Well, at this point other groups had used this chalking method for promotion for upcoming events such as some sort of Neon themed party and what we believed to be a bingo night but was actually Electronic Dance Music (EDM) artists by the name of Bingo Players. And no, we weren’t going to get arrested for a bingo night promotional failure. We had a much bigger cause. Jesser and I are some of the founding members of a new group on campus known as Peace Action with Ersfeld as our President. During this time Peace Action was gearing up for one of its first events, a Gun Violence Awareness rally in association with the College Democrats featuring several politicians from throughout the State. For promotional value, like other groups on campus, we decided to have a demonstration using chalk. Now this demonstration was halted by campus security and UPD. But, our message had some real worth. Our demonstration featured chalk body outlines and haunting facts and statistics about people of all ages-young and old- who were killed by domestic gun misuse. This is something that needs to be addressed on campus as a national issue. I guess because we are opening the eyes of students and faculty alike to real issues and not promoting some party, our promotion must get washed away. Because we definitely should be arrested for informing students of the negative effects of owning a gun without properly securing it or how easily one can be obtained without even having to undergo a background check. We just have to have our rights to free speech and free assembly be halted because we’re “defacing school property” by using condensed dust particles of varying pastel colors. School property, which the fellow student body is paying for through our tax money and tuition, not to mention, is public property. It hardly seems fair that our freedom to send a message effectively can so easily be washed away due to “restrictions.” The security officer, for example, told us we needed special permission to draw on the ground. This statement had our president, Ersfeld, question why we needed special permission to use dust on the floor that easily washes away through a natural rainstorm. We just wanted to put the word out there, which we are constitutionally entitled to. I guess on this campus, constitutional freedoms come at a limit. We can express whatever we want, as long as we have special permission to do so first, of course. And b) they have statistics surrounding them, perhaps it’s obvious that they aren’t real. We aimed for shock value; after doing the outlines for two days, with no one actually being threatened or harmed, we deemed it pretty obvious that no one was going on a murder spree around campus. These served as a type of memorial of sorts, for people to remember and honor these innocent deaths and increase their concern for these types of incidents. Not only did Peace Action perceive their erasing as an infringement on our right to freedom of speech but also disrespectful to just “erase” away the names of the victims who should live on. 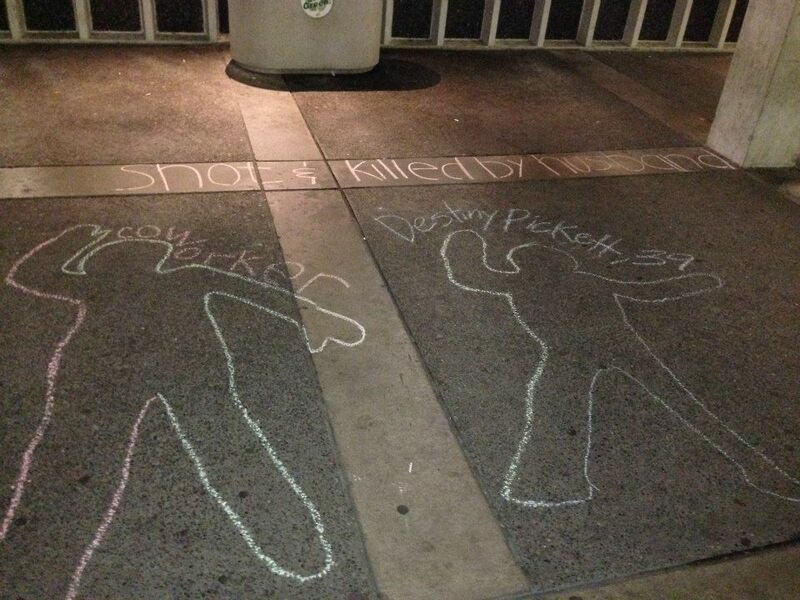 UPD’s and campus security’s main concern should not be centered on students playing with non-threatening chalk. They should be concerned with going out and finding those people that we are constantly getting emails about. Those people, who are coming onto our campus, whether they be armed or come to abduct people, are real threats to students. Even a UPD officer that Jesser and I spoke to thought a complaint about chalk wasn’t that serious. He simply explained that he got the call and he acted on it. My only confusion now is just what exactly constitutes as a crime on this campus. Legally, chalk isn’t a medium used for graffiti. Constitutionally, students, and people on the greater spectrum are allowed to freely express themselves. And yet, we got stopped. I suppose this campus runs on a different operating system. Nevertheless Peace Action will continue to extend the knowledge of peoples’ rights to the students to ensure that we are not silenced again and will be continuing efforts looking into our rights as students. After all, the University can’t take away our basic human rights.